This class is an ideal compliment to the Preparation for Labour and Birth Workshop held in two parts over the weekend at Idless Mill. It is also a useful addition to courses such as the NCT Antenatal course and the NHS classes run by your midwives. It is also a good second time round revision for parents about to have their second or subsequent children. During the class we look in detail at useful postures for the different stages of labour. First stage positions consider the lie of your baby and we look at ways of encouraging babies to move from less favourable positions such as a posterior position into a more favourable position such as an anterior position. We practice movements that help to conserve our energy if labour is particularly slow to get going. We learn to work with our babies and our bodies so that we can optimise the conditions under which our labour takes place. During the second stage of labour when the birth of our baby occurs we look at ways of helping our babies to be born in the safest possible way. By working with the natural physiology of our pelvis and the force of gravity we practice positions that facilitate the journey our baby makes. We also consider how we can reduce the risk of unnecessary tearing. The third stage of labour is when the placenta is delivered. We look at how we can minimize the risk of haemorrhage and maximize the first contact we have with our babies. As well as all the above, partners learn tried and tested massage techniques using a relaxing organic oil. Breathing methods are explained and suggestions are made for the different stages of labour. 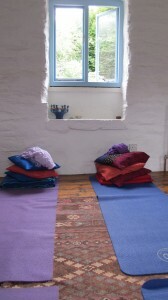 Classes are held at Idless Mill, Idless, Truro. Price is £60 per couple if attended part 1 and 2 or £70 per couple otherwise. Yoga mats, cushions, blankets, towels, organic oilsand refreshments are provided. One to one Active Birth Classes for couples can be arranged to suit your requirements.